In the highest-scoring game in franchise history, Daniel Murphy hit two early home runs and the Washington Nationals kept pouring it on against emergency reliever Jose Reyes and the New York Mets in a 25-4 rout Tuesday night. The New York Mets have been searching for any reason to smile during a miserable season. This laugher wasn't exactly what they had in mind. "Even to throw Jose Reyes out there and the guys hit them like they did, you don't even see that in BP," Mets manager Mickey Callaway said. "Those guys were locked in, they came out tonight and they beat us up pretty bad." The Nationals set the team scoring mark dating to their days when they started as the Montreal Expos in 1969. It was the Mets' most-lopsided loss in their 57-season history, worse than a 26-7 pounding by Philadelphia in 1985. It got so out of hand, Mets television announcers Keith Hernandez, Ron Darling and Gary Cohen took turns reading verbatim from the team's media guide in the late innings — the SNY network played the theme from "Masterpiece Theatre" in the background. This time, Reyes floated in a pitch that hit Zimmerman in the leg. Zimmerman did a little shake in the batter's box, then playfully faked a charge toward the mound, drawing a laugh from Reyes. "I didn't want to make two outs against him. I've played against Jose for a long time. He's one of my favourite players to play against," Zimmerman said. "He always has a smile on his face. That was pretty funny and surreal to hit against him after all that we've been through against each other." "When you are on the mound before you throw a pitch, it's fun," he said. "But when you start to see people hit a homer and stuff ... I don't want to see that." Asked if he was available for Wednesday's game, Reyes kidded: "Not for pitch." Reyes wore one of ace Jacob deGrom's gloves on the hill. DeGrom was among many players on both sides chuckling at the spectacle. Trea Turner, who apologized before the game to his teammates for homophobic and racially insensitive tweets he sent several years ago, had four of Washington's 26 hits. Pitcher Tanner Roark hit a three-run double during a seven-run first inning. 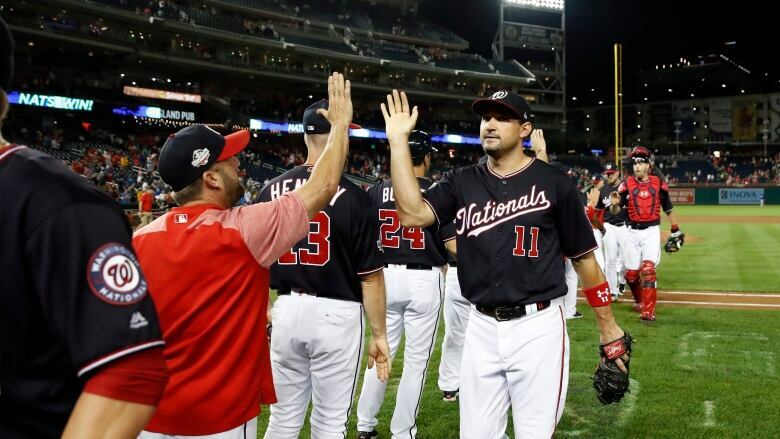 "It's been an emotional day and it was a good way to end it," Nationals manager Dave Martinez said. The homer came after Kelly, working quickly, had been told to slow down by the plate umpire. "I was just trying to get through the inning and get the game over with," Kelly said. "I thought everybody had seen enough baseball for one evening."